Porsche is among the world's most renowned car makers. Among the company's current line up of vehicles, there is the Panamera, a luxury four doored sedan that was released a few years back. 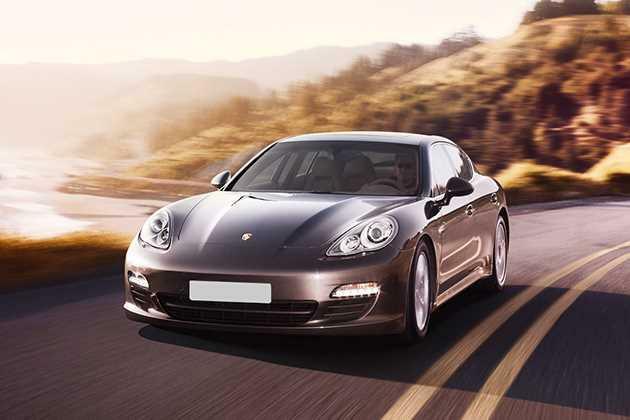 Currently, the company is offering the vehicle in a range of variants, and Porsche Panamera Base variant is also notable for its standard list of features. This trim is powered by a 3.6-litre V6 engine that delivers good performance. With the aid of this engine, the variant can touch top speeds of 259kmph, and can go from rest to 100kmph within just 6.3 seconds. Coming to the exterior facet, the vehicle carries the same exterior template as many other models of the company. However, this vehicle has a heftier pose with milder sports themes. Its height is 1418mm, while its length and width are 5015mm and 1931mm respectively. Meanwhile, its wheelbase is 2920mm, enabling a spacious interior arrangement for the passengers. There are comfortable seats furnished inside the cabin with premium upholstery, and equipped with a good range of comfort and entertainment functions. At the front, the front skirts have gentle contours that add to the car's elegant build. At the bottom, the wide air intakes provide cooling to the engine, and also pose for a good look. The headlamp clusters are intelligently designed, and the company has incorporated them with Bi-Xenon light systems along with daytime running lights for improved visibility. The power dome on the bonnet adds a distinctive touch to the vehicle. Coming to the side, there are standard 18 inch alloy wheels fitted to the fenders. The neatly designed door handles integrate into the overall picture perfectly. The sharper rear contouring, along with the sporty exhaust pipes, add a lively flavor to the car. The company is offering this variant with an option to choose from 16 exterior colors for added personalization. The cabin is intelligently modeled, meant to ensure a good level of comfort and space for all of the passengers. The high gloss black interior package makes for an excellent environment. There are four individual seats that come with partial leather upholstery for a more rich feel. There is a center console armrest at the front that comes along with an integrated storage compartment including a folding armrest at the rear. The three-spoke sports steering wheel has its rim in a smooth-finish leather. For added cabin quality, there are door sill guards in brushed aluminum, along with a model-specific logo at front. The accent trims with silver-colored finish further improve the plush cabin environment. Beside all of these standard features, additional options are available including floor mats, 2 folding cup holders above the glove compartment and a SportDesign steering wheel for personalizing the cabin. Armed with this variant is the powerful 3.6-litre V6 petrol engine. Each of the six cylinders consist of four valves and runs on the overhead camshaft configuration. Furthermore, it benefits from a VarioCam Plus system, along with an integrated dry sump lubrication. It is given the direct fuel injection for effective fuel transfer. It is water cooled with a thermal management system, promoting efficiency in its performance. This 3605cc mill has a power output of 310hp at 6200rpm, alongside a torque of 400Nm at 3750rpm. The engine is paired with a 7 speed dual clutch transmission that enables smooth gear shifting for better performance. The engine is also conducive for a good fuel economy as it delivers a mileage of 11.8kmpl. The machine has a strong braking system that consists of six-piston aluminum mono-bloc fixed brake calipers at the front and four-piston calipers at the rear. Furthermore, these brake discs are slotted and internally vented, enabling an improved braking quality. Coming to the suspension arrangement, a steel spring based system ensures good handling and stability. The front axle of the chassis is rigged with an aluminum double wishbone arrangement, while the rear axle has an aluminum multi link system. On the other hand, the Porsche active suspension management system is available as optional feature. It regulates the damping force on each wheel, thereby eliminating discomfort for the passengers and enhancing stability. Available as standard is a CDR audio system that comes along with a a 7-inch colour touchscreen. For added convenience, there is also a dynamic auto-store and speed-sensitive volume control, while 10 loudspeakers help to generate the apt sound quality. There is an automatic climate control with an automatic air-recirculation mode, along with an air quality sensor and residual-heat function. The front passengers get the benefit of comfort seats that come along with an with electric eight-way adjustment for the seat height, squab, backrest angle and fore/aft position for maximum convenience. There is a 12V charging socket in the front and rear center consoles, the glove compartment and the luggage compartment, offering an ease of charging devices for the passengers. Beside all of this, there is an optional quad-band GSM telephone module that allows for making calls through a SIM access profile. The car has a rigid body-shell that protects the passengers and reduces damage in case of mishaps. There are full sized airbags for the front passengers, along with knee airbags for optimal body protection. Curtain airbags along with the entire roof frame and side windows provide improved shielding. Three-point inertia-reel seat belts with tensioner are present for all passengers, while there are force limiters specially for the front passengers. A Porsche stability management system is present along with ABS, and this enhance stability when driving. The rear seats come with ISOFIX child seat mounting points, offering additional safety during the presence of children in the car. Beside all of this, the vehicle's powerful lighting system consists of daytime running lights, LED systems, a main beam assistant, Bi-Xenon lights with range adjustment, timer controlled courtesy lights and also a headlight cleaning system for the best visibility and safety when driving. There is an anti theft protection system that comprises of an immobilizer, an alarm system and an ultrasonic interior surveillance, extending the security measures to the vehicle as well. 1. Lavish interiors with luxurious seating arrangement. 2. Engine performance and acceleration is good. 1. Advanced features can be given as standard. 2. Quality of audio system can be better. Porsche Panamera 2013-2017 is available in 52 different colours - Dark Blue Metallic Diesel 250HP Variant, Agate Grey Metalic, Ruby Red Metallic Turbo Variant , Dark Blue Metallic Turbo Variant , Black, Ruby Red Metallic 4 Variant, Carbon Grey Metallic 4 Variant, White 4 Variant, Jet Black Metallic Turbo Variant, Rhodium Silver Metallic GTS Variant, Yachting Blue Metallic Turbo Variant , Agate Grey Metallic 4 Variant, Mahogany Metallic 4 Variant, Sapphire Blue, Agate Grey Metallic Diesel 250HP Variant, carbon Grey Metallic Diesel 250HP Variant, Yachting Blue Metallic GTS Variant, Sapphire Blue Metallic 4 Variant, Chester Brown Metallic GTS Variant, Rhodium Silver Metallic Diesel 250HP Variant, Dark Blue Metallic GTS Variant, Mahogany Metallic Diesel 250HP Variant, Chester brown metallic, Mahogany Metallic, Mahogany Metallic GTS Variant, Rhodium Silver Metallic 4 Variant, Rhodium Silver Metallic, Carbon Grey Metallic Turbo Variant , Ruby Red Metallic, Yachting Blue Metallic, Ruby Red Metallic GTS Variant, Dark Blue Metallic, Carbon Grey Metallic, Dark Blue Metallic 4 Variant, Chester Brown Metallic 4 Variant, jet Black Metallic Diesel 250HP Variant, Jet Black Metallic, Chester Brown Metallic Diesel 250HP Variant, Yachting Blue Metallic 4 Variant, Sapphire Blue Metallic Diesel 250HP Variant, Agate Grey Metallic Turbo Variant , Jet Black Metallic 4 Variant, Black 4 Variant, Sapphire Blue Metallic GTS Variant, Agate Grey Metallic GTS Variant, Jet Black Metallic GTS Variant, Yachting Blue Metallic Diesel 250HP Variant, Black GTS Variant, Chester Brown Metallic Turbo Variant , Ruby Red Metallic Diesel 250HP Variant, White, Carbon Grey Metallic GTS Variant.